You’ll find pastéis de nata (or Portuguese custard tarts as many people have taken to calling them) in every café in Lisbon, and in Portugal. The question is: which café has the best ones? Most people assume the answer is Pastéis de Belém, and they could well be right. Pastéis de Belém have been making natas since 1837 and are considered to be the first to do so commercially. They’re loved by tourists and locals alike, and hold a special place in the hearts of Lisboetas. But, they’re not the only ones who make pastéis de nata. There are plenty of bakeries in Lisbon that have been supplying cafés for decades, as well as plenty that make them inhouse and are vying for the Best in Lisbon title. If you’re visiting Lisbon, don’t just visit Pastéis de Belém. That’s only part of the Lisbon pastéis de nata experience. 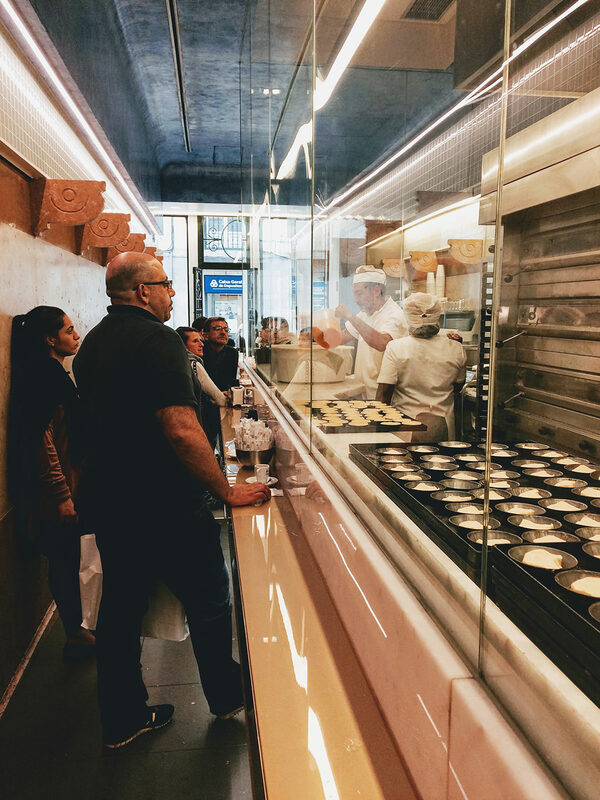 The real experience is to go on a nata crawl, either in one day or spread out over the course of your trip, and try all of the different bakeries to see which is the best. Having a bica (espresso) with your pastel de nata is all part of the experience, so keep that in mind when you decide how many to try in a day! Let’s start with the original. Despite all of the newcomers, I think Pastéis de Belém (originally called Antiga Confeitaria de Belém) could still make the best nata in town. It’s definitely in the top two, although I think the crust is a little crunchy. Despite how good it is, I almost never go there. The problem is that Pastéis de Belém is on just about every “things to do in Lisbon” list and, because of that, there are queues down the street every day. The café inside is noisy, messy, and it’s usually filled with screaming children. It’s just not a nice place to enjoy what is supposedly the best cake in Lisbon. Manteigaria only opened in the past few years, but they’ve quickly become my favourite place in Lisbon. Their natas are tasty, with just about the right amount of sweetness, and have a nice crunchy but flaky crust. Although their two locations are both small, they’re usually not too busy and you can enjoy a bica and a nata (or two) without feeling rushed or too cramped in. Of the two locations, I usually go to their Cais do Sodré venue next to the Time Out Market as it’s usually quieter. The original location, on Rua do Loreto, is nicer, but it’s usually busier because of its location in the centre of town. If you have to choose between the two, I’d probably go to Rua do Loreto venue as it’s much more photogenic. You can watch the natas being made here while you enjoy your nata and coffee. Aloma used to be based in the Time Out Market, but have since made their home in Campo de Ourique. Their natas are definitely very good, and have won awards in the past. Of all the venues mentioned, this is one of the nicest ones to sit down and have a coffee and a nata in. Campo Ourique is itself is also worth making the pilgrimage to. It’s home to many great boutique shops and a much smaller version of the Time Out Market, Mercado de Campo de Ourique. Aloma might seem new, but it’s actually one of the older venues here. It has been going since 1943. As well as pastéis de nata, it’s also a good place to try some other Portuguese pastries and cakes like Tartelete de Amêndoa, Jesuita, Pão de Deus, and Palmier. Cristal is an unusual venue, and feels just like a normal, quiet Portuguese café – the kind that makes great, but maybe not award-winning pastéis de nata. Unlike Pastéis de Belém and Manteigaria, it’s not located in a touristy part of town. It’s not even located in an upmarket part of town like Campo de Ourique where Aloma is located it. It’s on a quiet unassuming street and, if you didn’t know that Cristal was known for their natas, you could easily walk by. Fábrica da Nata is another venue that’s opened in the past few years and, in that short time, it has quickly racked up thousands of fans. 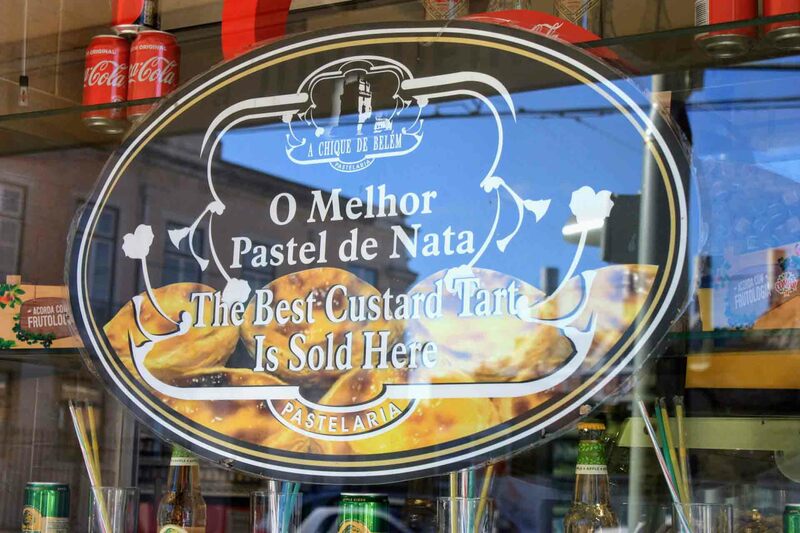 Most pastelarias are good but they have a “but.” For example they might have delicious natas but there’s nowhere to sit down, or the shop could be in a part of Lisbon that’s difficult to get to. Fábrica da Nata has none of those problems. It’s easy to get to, has plenty of nice seating, and allows you to watch the natas being made. But does it do the best natas? That’s the most important question. Well, you’ll just have to go and see for yourself. They have several venues in popular parts of Lisbon, and a branch in Porto as well. 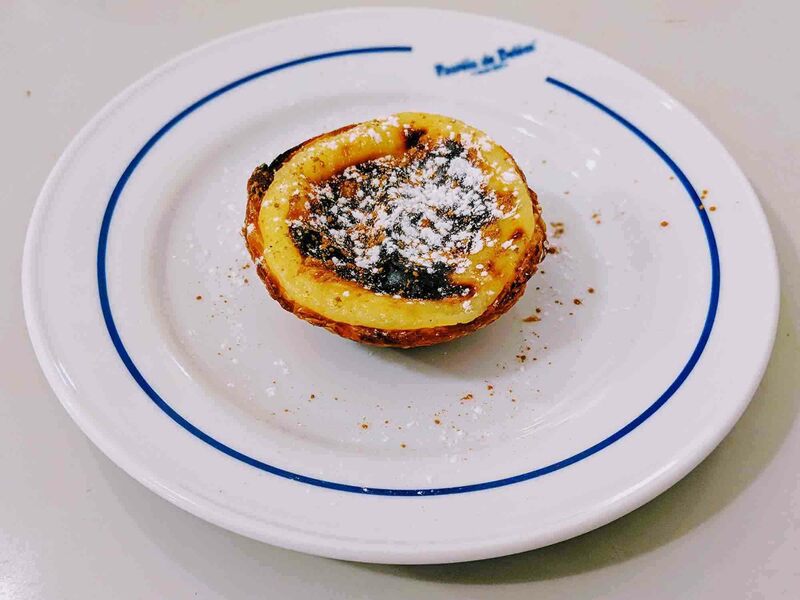 Pastelaria Santo António had only been open for around 2 years when it scooped up the 2019 “Melhor Pastel de Nata” award. The pastelaria is located near Lisbon’s castle and, up until now, has only really been somewhere that tourists know about. The pastelaria are hoping that this win will mean more Lisboetas will come in to try their natas. Winner of the 2018 “Melhor Pastel de Nata” competition, Mercado do Peixe is situated in Lisbon’s Ajuda neighbourhood. 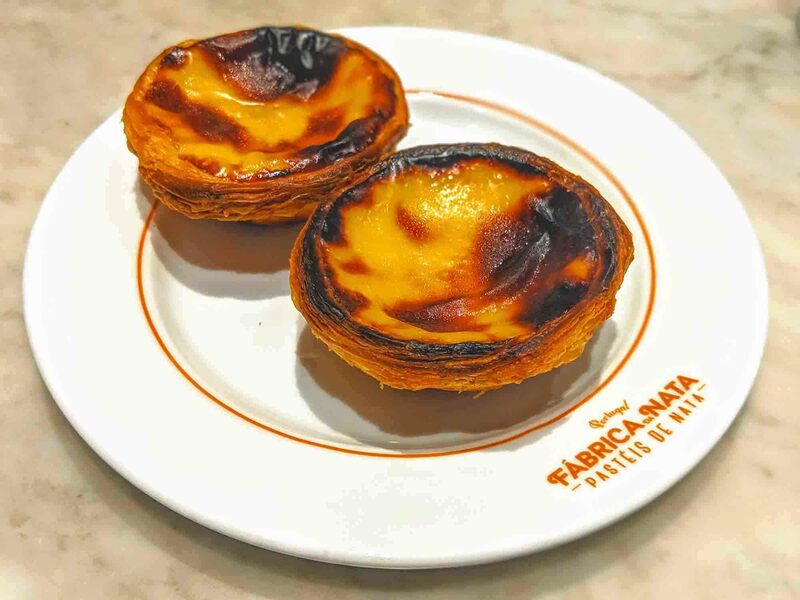 This venue is a restaurant rather than a bakery, so you’ll have to work your way through some Portuguese fish or seafood dishes if you want to sample their award-winning pastel de nata. 2017’s “Melhor Pastel de Nata” victor was a small pastelaria in Ericeira called O Pãozinho das Marias, around 40 minutes by car from Lisbon. This is a part of Portugal that’s normally known for its surfing, and somewhere many people go to learn to surf, but now there’s at least one more great reason to visit. Fim de Século was the 2016 winnter of the “Melhor Pastel de Nata” award which takes place every year in April during the Peixe em Lisboa gastronomy festival. The pastelaria is located in Benfica, which is a little far out for most people visiting Lisbon unless you’re watching a football match or heading to Colombo Shopping Centre.